I was brought up and have continued to live in Colchester, Essex, England. I spent much of my life as a self taught artist until graduating from a Fine Art degree in 2014. I am influenced by an interest in the process of abstract expressionism and surrealism. A lifelong interest in psychology and alternative therapy has drawn me to the work of abstract expressionists and surrealists. 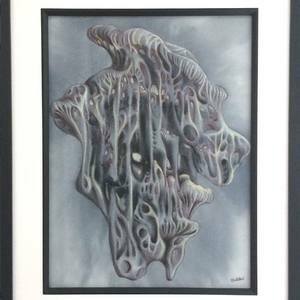 My work is process led; The image begins life as a random composition of material having been allowed to take its own form; the image is brought to life by drawing into the abstract composition with ballpoint pen and other media, its detail inspired by a strong interest in natural forms.